Saturday March 22nd 1884 The sun shone a little today for the first time in a week. I ironed before dinner. Hatt and Win were over in the afternoon and brought Edith with them. I sewed what time I had to spare from the work. Sunday March 23rd 1884 I was busy about the work all the forenoon and in the afternoon we talked with Mr Custor he spent a couple of hours here. John and Hatt spent the evening here and we had such a good visit. Weather not so pleasant as yesterday. 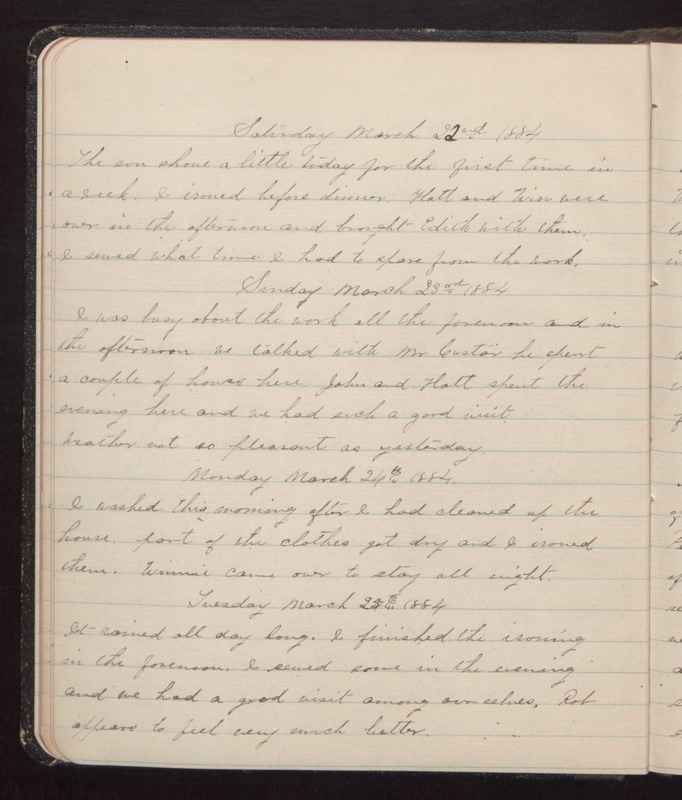 Monday March 24th 1884 I washed this morning after I had cleaned up the house. Part of the clothes got dry and I ironed them. Winnie came over to stay all night. Tuesday March 25th 1884 It rained all day long. I finished the ironing in the forenoon and sewed some in the evening and we had a good visit among ourselves. Rob appeared to feel very much better.